N.B. If you are setting up an online assignment for the first time, you are strongly advised to check with colleagues whether there are any departmental practices that might affect your choice of settings. Go to the relevant course, Turn editing on and select Add an activity or Resource. Give the Assignment a meaningful name. 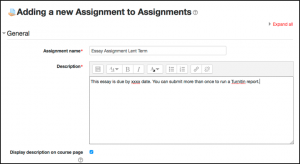 Use the Description to provide clear instructions to students about the assignment. 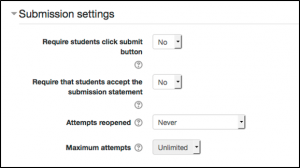 Leave the checkbox selected if you want the description to be visible to students both on the course home page and when the assignment is selected. In Availability, select an opening date (if it is not to be immediate) and a Due date. Use Cut-off date if you are permitting submissions for a certain period after the due date. All such submissions will be marked late. Inform students of the cut off date within the description as it will not display automatically on the submission page. (You can also grant extensions on an individual basis). Deselect Always show description if you do not want the description to show before the from date. In Submission types, choose the format of the submission. The default File submissions, which requires students to upload files, is the most likely option. Click ‘?’ to the right of each option for more information. 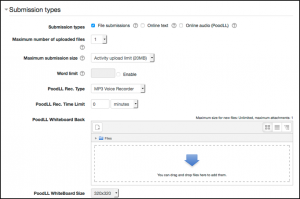 If students are submitting multiple files, use Maximum number of uploaded files to set a limit. You can also set a Maximum submission size for all files (within the 20MB limit for the course) and a Word limit for online text submissions. In Feedback types, choose the type of feedback to be provided to the student. If you are unsure, leave everything selected. For more information on each option, click ‘?’ that appears beside each option. 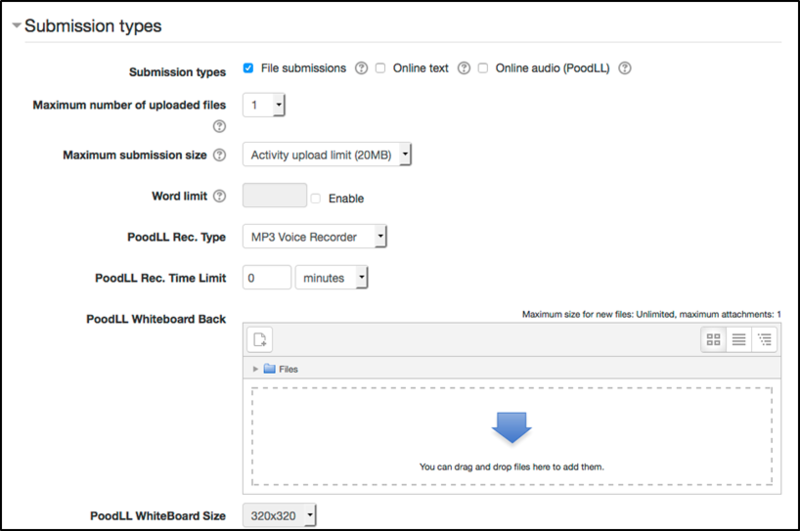 For information onusing PooDLL see Provide audio feedback for an Assignment. In Submission settings, the default settings below are applicable in most cases. You are strongly recommended to leave Require students click submit button as No otherwise there is a risk of students failing to submit their final version as Moodle will treat it as draft. If you set Yes on Require that students accept the submission statement, it means that they will be asked to accept the below statement before submitting. Group submission settings – if students are preparing group submissions, you need to make sure the assignment is set up accordingly. See Create an Assignment for group submissions. Settings for Notifications are usually best left as the defaults below i.e. 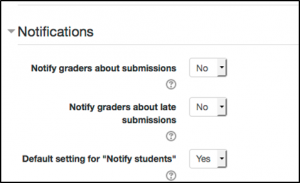 markers do not receive notification of every submission while students receive confirmation of their individual submission. 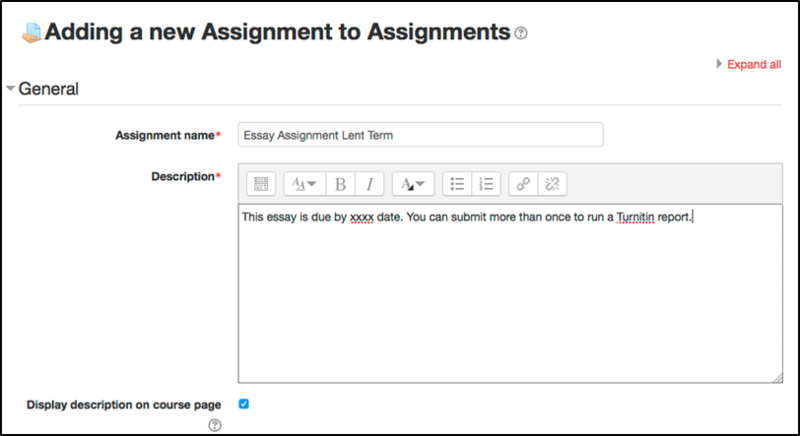 To include Turnitin originality checking within the assignment, see Set up Turnitin within an Assignment. 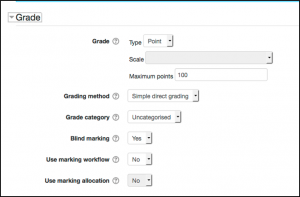 In Grade settings, use the default settings below for a standard assignment to be blind marked out of 100. YOU MUST ENABLE Use marking workflow here if you want to mark through a series of stages (In marking, Marking completed, In review, Ready for release, Released). For more information see Use Marking Workflow for Assignments. 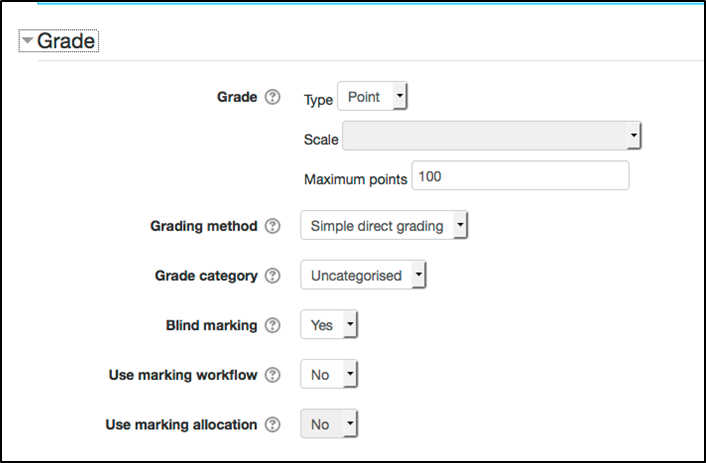 If you use marking workflow you can also enable marking allocation, see Use marking allocation for more information. Also, check Create and grade a submission using a Rubric. For information on these options, click ‘?’ or contact lti.support@lse.ac.uk. Please note Blind marking is enabled by default, those with the Manager role will still be able to see student identities but Teacher and Teacher Editor roles will not. Select ‘No’ under Blind marking to display student names. Common module settings can be used to control visibility and whether Groups are to be activated for the submission. If these do not apply, leave as default. If you would like to apply groups to an assignment e.g. for marking purposes, see Create and Use Groups. Restrict access only applies if you need to limit access based on certain criteria e.g. achievement of a specified grade in another assignment. See Restrict access (Moodle docs). The assignment settings process is complex and you may not get it right first time. You can always return to it by selecting Edit Settings. However, please exercise caution if you are doing this after students have submitted. If, for some reason, there is a change in the submission deadline, you can change the original dates by editing the assignment. However, if you need to extend the deadline for individual students, there is a different method. N.B. This will not work if blind marking is in use and the usual Teacher Teacher/Editor) role. Contact lti.support@lse.ac.uk if you are unsure. Click the assignment and select view/grade all submissions. (You can do this regardless of whether there have been any submissions). Select the student or students to whom you want to grant an extension. Scroll down to the end of the page, select Grant extension from the With selected drop down and Go. Choose a new Extension due date and Save changes.